and create something new in me. "My Neighbor is Muslim: Exploring the Muslim Faith." The authors of this resource include: Todd Green, of Luther College; Dirk Lange, Matthew Skinner, Karoline Lewis, Rolf Jacobson, Eric Barreto, and Adam Copeland, all professors at Luther Seminary; and Yusuf Abdi, Director of Refugee Services, LSS of Minnesota. "Honoring our Neighbor's Faith: A Lutheran Perspective on Faith Traditions in America." How do we view the wide variety of faith beliefs and practices in the United States? How does the Lutheran tradition compare with others? This book deals with these questions by deepening our understanding of various faith traditions, as well as our own, making it a valuable resource for congregational study or personal exploration. This book explores thirty-two faith traditions that represent a wide spectrum of beliefs or stand out due to their size or public profile in America. by Margaret R. McLean, Associate Director Markkula Center for Applied Ethics. She gave a great presentation and these slides offer many excellent insights into Lutheran Ethics! A great resource to get you thinking. VBS resources are 'out there' and in here, at your Resource Center! It IS time to begin considering and planning for his summer's VBS! The Resource Center can help you in many ways. "Weird Animals" and "Everest!" AND MORE! We can loan you one of these kits for a few months! I would love to help you decide what VBS is best for you. 2016 has no shortage of VBS programs!!!! We do have the 2016 Group Cave Quest at the Resource Center for hands on viewing. Email me if and when you will be in Fresno! just send me an email with your questions. Your Synod Resource Center now has a masterful three-volume biography on Martin Luther. Volume 1: "Martin Luther: His Road to Reformation, 1483-1521." Volume 2: "Martin Luther: Shaping and Defining the Reformation, 1521-1532." Volume 3: "Martin Luther: The Preservation of the Church, 1532-1546." These books are returning with great accolades! If you are interested in learning more about the life of Martin Luther, you would LOVE this series. Click here to Email Janet your request. Get your name on our waiting list. Reading this series is a great way to get excited about Reformation 500!!!! ****And, here's a link for an exciting resource related to Reformation 500!!!! Do I sense change in our world? I am praying for that! With Reformation 500 approaching, this is a great time to have a class on Luther's Small Catechism. 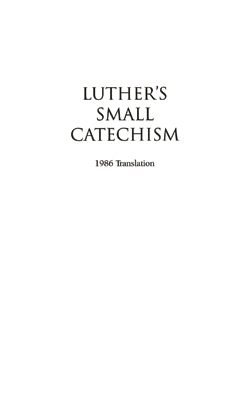 To date we have sent out over 1,400 Small Catechism pamphlets. "dusting off the catechism and taking another look at the basics of our faith. "The Bible is alive, it speaks to me; it has feet, it runs after me; it has hands, it lays hold of me." "Whatever your heart clings to and confides in, that is truly your God." "To be a Christian without prayer is no more possible that to be alive without breathing." You are helping us to do a better job when you recommend the specific resources you are looking for. Please note that the Synod Resource Center of the Sierra Pacific Synod is eligible to receive your Choice Dollars from Thrivent Financial. We are sincerely grateful to Thrivent Financial and those individuals who designate their Choice Dollars to us for the support of the Synod Resource Center.